The circus arrives without warning. No announcements precede it. It is simply there, when yesterday it was not. Within the black-and-white striped canvas tents is an utterly unique experience full of breathtaking amazements. It is called Le Cirque des Rêves, and it is only open at night. But behind the scenes, there are two young magicians locked in a duel with each other. Not very often an author is able to write a book that puts my own writing to shame. 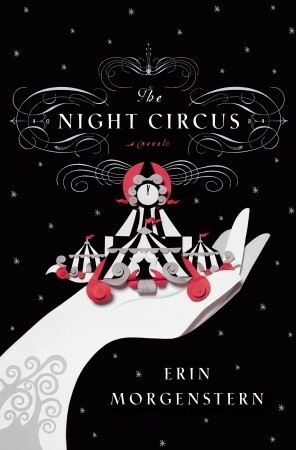 Erin Morgenstern, however, has been able to do just that with her debut novel, The Night Circus, and it is not hard to see why it quickly became a #1 New York Times bestseller. The novel is what I have only come to be able to describe as exquisite. The prose, the romantic tension between the two main characters, the descriptions of the circus’ black and white tents, the scent of caramel drifting through the air– they are all developed and described in such a way that it is hard to believe that this is Morgenstern’s first book. One of the things I am always looking for when I am reading a novel is the interaction that the characters have with each other and if it is genuine. Morgenstern has no issue with making this happen. The emotions between the characters are easily conveyed, and the dialogue is well-crafted. Celia and Marco, the two magicians whom this story revolves around, are great characters. I was always looking forward to the chapters that were about them and the emotions that form for the other. The scenes in which they were together were beautiful, and the chemistry between them was unique. I didn’t want those scenes to end. The Night Circus is the first book I have read in which the author writes in the third person present and second person present. I am surprised at how well Morgenstern used this writing style. The style allows her to describe the setting, the motivations and the emotions of the characters in a way that she wouldn’t have been able to if she had done it any other way. When I read this book, I wanted to get further into the story, but then, I also found myself wanting to be lost in the world of Le Cirque des Rêves, and in the rooms of ice and bottles and illusionists, not wanting the magic to end. I am sure you will not want it to either after you read it.